Why does my truck have two batteries? A: Ah yes, that is a good question. The first time you get a big truck and take a look under the hood you might just do a double take when you see two batteries instead of one. The two batteries are for higher cranking amps, which are needed for the high resistance load that a diesel engine requires during starting. Simply put, it takes a lot more power to turn the engine over, in fact, the compression in a diesel engine is a hair over 17:1 compared to a gas engine compression ratio of around 9:1. The voltage system in the vast majority of regular production vehicles is a 12 volt system. 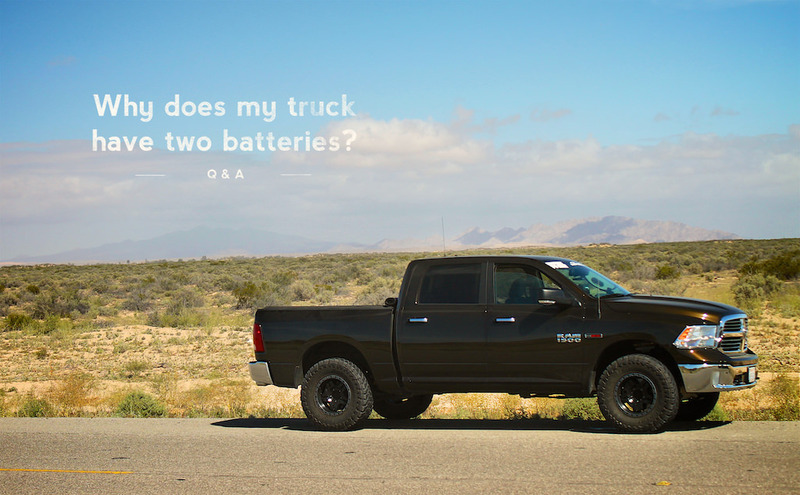 The batteries in your truck are wired in “parallel”, whereby the positive terminal of each battery are hooked to one another as well as the negative terminals. 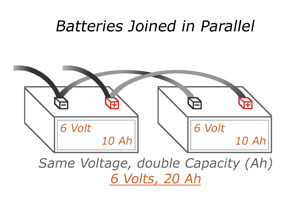 “Parallel” connections will increase your current rating, but the voltage will stay the same. So you have more energy to use in total, but you will not increase the amount you use at once, keeping your electrical components safe. 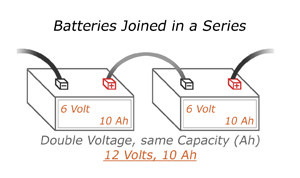 In the diagram below, the batteries are connected together to increase the Amps to 20 while keeping the voltage the same. It’s important to note that because the amperage of the batteries increased, your truck requires heavier duty cables to avoid a burn out. A “Series” configuration adds the voltage of the two batteries, but keeps the same amperage rating (also known as Amp Hours). For example, these two 6 Volt batteries joined in series now produce 12 Volts, but still have a total capacity of 10 Amps. This is useful for applications that require higher voltage, but it is NOT to be used in your truck. This is important to know in case you ever decide to change your batteries yourself. Increasing the voltage would fry your electronics and this is not something you would want to do! In theory, you can connect as many batteries together as you want. But when you start to construct a tangled mess of batteries and cables, it can be very confusing, and confusion can be dangerous. Keep in mind the requirements for your application, and stick to them. Also, use batteries of the same capabilities. Avoid mixing and matching battery sizes wherever possible (but that is a discussion for another day!). Why do I need to have my wheel re-torqued? Would not an 800CCA battery or more be sufficient ? Why would it need 2 batteries ? Hi there, please send us a note through our contact form to speak with a technician.